A beautiful symbol of life, a floral tribute is a wonderful way to express your feelings for a friend or loved one. 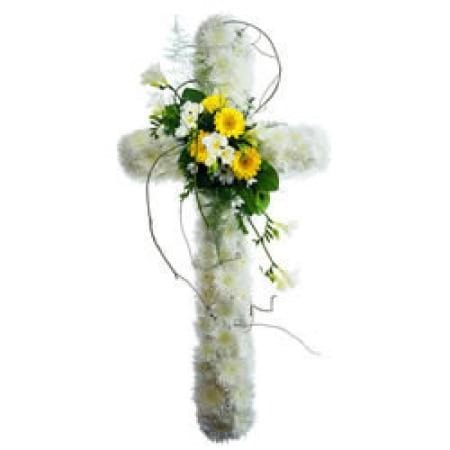 This floral cross wreath is suitable for delivery to the funeral service only (it is not suitable for delivery to the home). An inspired Interflora design the white chrysanthemum cross wreath with a spray of gorgeous fresh seasonal blooms, roses and gerberas in a long lasting wreath arrangement. Created by Amaranthine Flowers By Design, Charlestown Square, Newcastle.